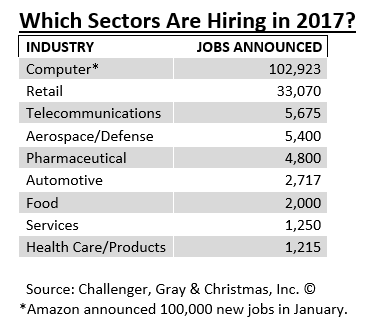 High Quits Rate, High Confidence: Challenger's Hot Jobs in 2017 | Challenger, Gray & Christmas, Inc. Employed Americans are quitting their jobs at the fastest pace in 16 years, and recent data shows a substantial amount of confidence in the U.S. economy. According to the Bureau of Labor Statistics (BLS), the quits rate rose to 2.2% and 3.2 million Americans left their jobs in January – up from 2.9 million in January of 2016. What is triggering this recent worker exodus, and where are workers going? “We are tracking a lot of hiring announcements right now, and the positions advertised include good pay and benefits. Many of the top jobs are in tech, STEM, and related fields, such as data management and analysis,” said John Challenger, CEO of global outplacement and executive coaching firm, Challenger, Gray & Christmas, Inc.
“Most people are unlikely to quit their jobs unless they are confident they will find better employment, and the higher quits rate shows workers may be finding higher paying or more fulfilling opportunities elsewhere,” Challenger said. Gallop’s weekly U.S. Economic Confidence Index has been steadily positive since the second week of November after the election. Additionally, CEO’s of some of the largest U.S. companies are expressing confidence in the economy. The Business Roundtable’s CEO Economic Outlook Index, saw a 19.1 point jump to 93.3 percent in the first quarter of 2017, higher than its historical average of 79.8 in seven straight quarters. “When CEOs are confident about the economy, it translates into new job opportunities. They want to make sure their companies are well stocked with talent for growth,” said Challenger. In addition to higher economic confidence, over one-third of US workers are prepared to look for greener pastures. According to Gallup, 35 percent of workers have left their jobs in the last 3 years, and 91 percent of those landed at new companies. The jobs appear to be available. According to the latest Job Opening and Labor Turnover Summary (JOLTS), job openings increased by 1.6 percent in January to a seasonally-adjusted 5.6 million openings. Meanwhile, Challenger has tracked over 162,000 hiring announcements in the first two months of the year, the highest January-February total on record. “The low unemployment rate, coupled with high confidence and increased job openings, spell new opportunities for the nation’s job seekers. As workers jump ship for better jobs that are potentially higher paying and offering stronger benefits, it’s possible that wages will rise,” said Challenger. Indeed, wages do appear to be on the rise. Earnings figures from January to February show an overall increase in hourly wages of 0.2 percent, and a 2.8 percent increase since the previous year. Despite this good news for job seekers, many employers, especially in tech, manufacturing, and engineering are experiencing a skills gap and need to find qualified workers. That means job seeker will need to brush up on their skills or embark on more intense education to land a position. “For employers to entice talent, they’ll likely need to offer attractive compensation and benefits packages. However, it’s not all about the money. Workers want to feel connected and engaged with their positions, have work-life balance, and feel secure in their jobs,” said Challenger. Data Scientist - These professionals are increasing in demand at the US’s biggest companies. This is due to the immense amount of data many companies have collected through surveys, customer service records, consumer preferences, website activity, social media, and many other forms of data collection. Education needed: A STEM background with extensive knowledge in computer science will help. DevOps Engineer - At the heart of software development and information technology operations, DevOps Engineers construct programs that streamline company operations. Education needed: A degree in computer science along with programming skills are needed. Data Engineer - Large-scale data needs to be easily processed and organized properly – Data engineers help construct, test, and maintain large databases while also building high-performance algorithms. Education needed: An advanced degree in computer science and experience with large data sets are needed. Tax Manager -Taxes are becoming increasingly harder and will not be leaving anytime soon. There is a high demand for individuals who can deliver a full range of tax services in compliance with laws and regulations in a timely matter. Education needed: A bachelor’s in accounting or finance as well as a CPA or similar certification are needed to qualify. Human Resources Manager -The increase in job openings and hiring since the recessions has allowed for a demand in professionals to oversee the whole hiring process and provide adequate training to new employees. Education needed: A related degree in HR management, as well as great people and communication skills are needed.